Freda Finds a Good Home” by Trine Lee | Marbella Marbella – Adelante! FAMA was recommended to me by a friend who helps FAMA every now and then as she knew I was looking for a nice dog to live with me in the country of Coin and also a good animal shelter to help. I had already done some research on their website and so I emailed Patricia and eventually came the day of my visit. I was pleasantly surprised to see how passionate and engaged Patricia and her colleagues were when it came to the well fare of all the animals. I had already seen a picture of Freda on the website and liked her so I was happy to finally meet her and eventually adopt her. She has a very curious and caring nature once she trusts you and adapts very well into new places. Our house first of all, the house of my parents, the forest, the grounds of the area, driving and one of our local cafes. Each day she seems to settle in more and more and I feel very safe with her. She gets along with my parents Labrador very well and enjoy playing with him. Also other dogs who we meet on our long walks each day in the nearby forest or about the grounds of where we live. She never attacks other dogs or people and rarely barks. She is very alert to her surroundings when we walk together and respond to my actions. She walks on a leash without trouble and uses a seat belt in the car too. One of the most important things she is learning right now is that when I leave the house I always come back. She has lots of toys and only a few times has she torn up a few things. Its vital for me and her that she stays a healthy dog and true to her nature but also respond to rules so that she learn that there is a balance between play time, walking, cuddles and rest time. Its only been little over a week but I am certain FAMA helped me choosing the right dog. I am looking for funding to put together a fund-raiser event in favour of FAMA and my little dance company Lee Dance. It will be an event with live music, dance performance, film showing and art I hope. Any funding is of the greatest help and nothing is too small as we need to make people even more aware of how much animals in Spain need us and show what artistry can do to join people together. Let us help FAMA to continue their mission and lets break barriers together through movement! Freda has been adopted. 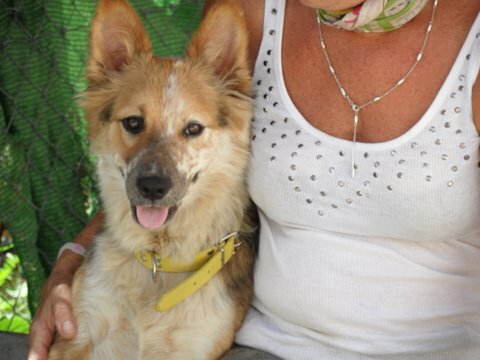 Trine a delightful young woman came to the shelter with a view to adopt a FAMA dog. I introduced her to all of our residents. When talking with her she said she had seen Freda on our website and felt a closeness to her even before they had met. When they did meet Trine was very taken with her. Freda was happy to be in her company. I checked where she would be living and of course what time she had to spend with her. 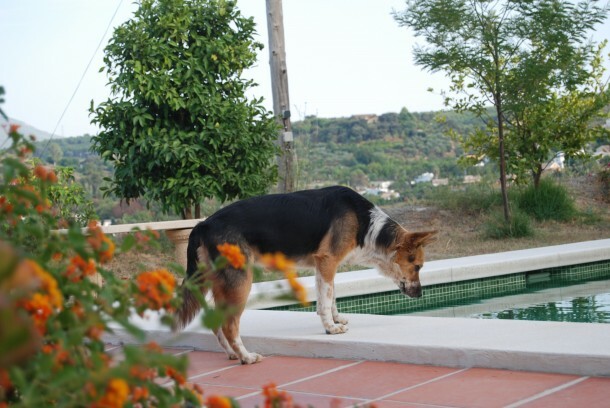 A finca with lots of fenced in land, a boy Labrador to play with, forest close to hand for walks and often working from home. How wonderful is that. As Freda would initially go for fostering to make sure both parties would be happy to share their lives together. I wish this story of Freda with a happy ending will be repeated thousands of times as we owe a great debt to all our dog friends who trust us! Dario. Tel (0034) 620 354 885. Patricia Coleman. SMS no. 27067MX fama.